This model shows how to test a closed-loop ADAS (advanced driver assistance system) algorithm in Simulink®. 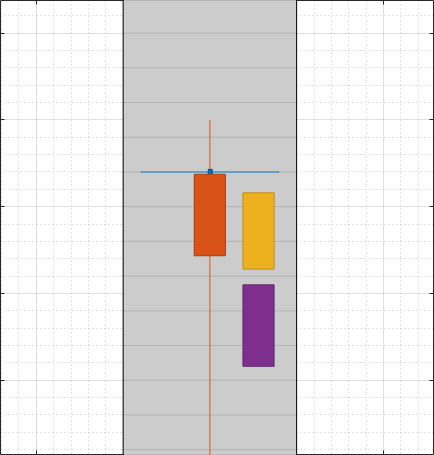 To test the scenario, you use a driving scenario that was saved from the Driving Scenario Designer app. 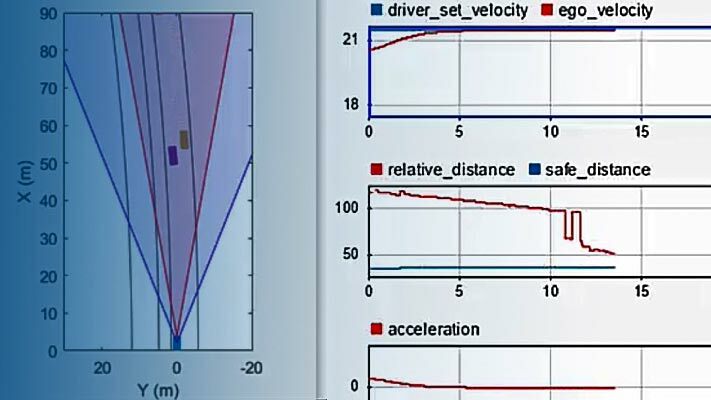 In this model, you read in a scenario using a Scenario Reader block, and then visually verify the performance of the algorithm, an autonomous emergency braking (AEB) system, on the Bird's-Eye Scope. This example uses a driving scenario that is based on one of the prebuilt Euro NCAP test protocol scenarios that you can access through the Driving Scenario Designer app. For more details on these scenarios, see Generate Synthetic Detections from a Euro NCAP Scenario. Click Run to simulate the scenario. In this scenario, the ego vehicle collides with a pedestrian child who is crossing the street. In the model used in this example, you use an AEB sensor fusion algorithm to detect the pedestrian child and test whether the ego vehicle brakes in time to avoid a collision. 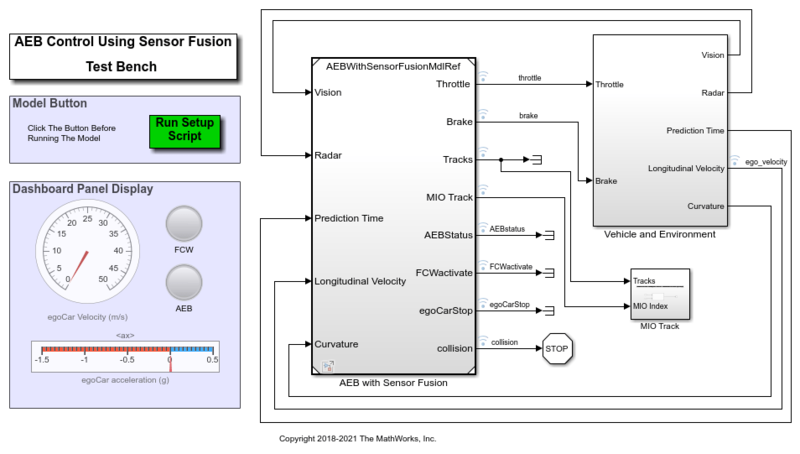 The model implements the AEB algorithm described in the Autonomous Emergency Braking with Sensor Fusion example. Open the model. A Scenario Reader block reads the actors and roads from the specified scenario file and outputs the non-ego actors. 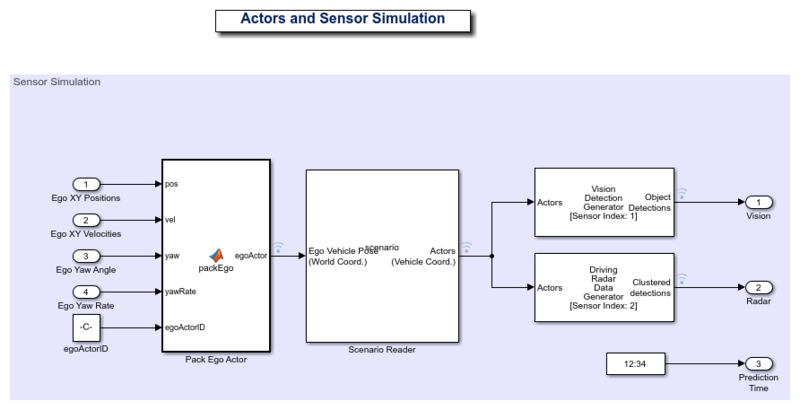 This block is located in the Vehicle Environment > Actors and Sensor Simulation subsystem. Open this subsystem. The Scenario Reader block outputs the poses of the non-ego actors in the scenario. These poses are passed to vision and radar sensors, whose detections are used to determine the behavior of the AEB controller. Although this scenario includes a predefined ego vehicle, the Scenario Reader block is configured to ignore this ego vehicle definition. Instead, the ego vehicle is defined in the model and specified as an input to the Scenario Reader block (the Source of ego vehicle parameter is set to Input port). As the simulation advances, the AEB algorithm determines the pose and trajectory of the ego vehicle. If you are developing an open-loop algorithm, where the ego vehicle is predefined in the driving scenario, set the Source of ego vehicle parameter to Scenario file. For an example, see Test Open-Loop ADAS Algorithm Using Driving Scenario. 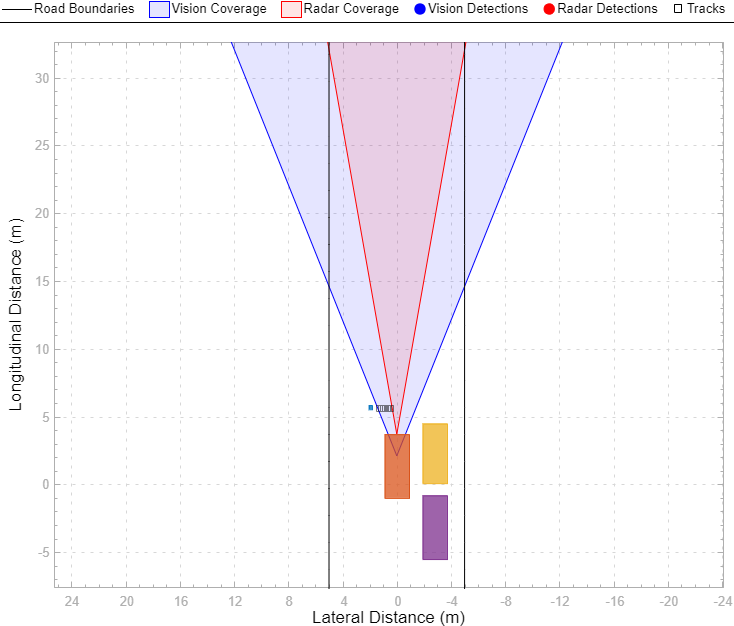 To visualize the scenario, use the Bird's-Eye Scope. From the Simulink model toolbar, click the Bird's-Eye Scope button. Then, click Find Signals, and run the simulation. With the AEB algorithm, the ego vehicle brakes in time to avoid a collision. When you are done verifying the algorithm, remove the example file folder from the MATLAB search path.